If you’re like me, you’ve probably tried to make a radical change in your life in the past….And failed miserably again and again. Maybe you’ve tried to lose weight, wake up earlier, or read more, and in the first few days, you feel great. 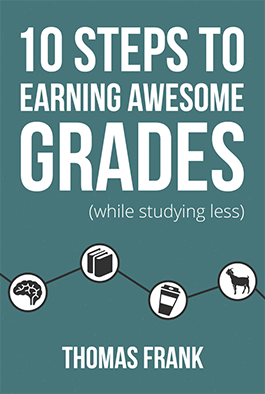 You feel motivated, and you nail your goals: you wake up at 6:00 AM; you eat grilled chicken breasts and broccoli every night, and you finish reading 10 Steps to Earning Awesome Grades (While Studying Less) in one sitting. You go! But by Day 4, you don’t even want to get out of bed. Thinking about all the stuff you have to do makes you want to hit snooze for the 4th time in a row, burrow deeper into your bedsheets, and snuggle up warm and cozy next to your Tickle-Me Elmo doll from when you were 10. I see you nodding along. So here’s the question I’ll try to answer in this blog post: How do you stay consistent and crushing it, day in and day out, whether you feel like it or not? One of the simplest ways to stay consistent in the keeping up any skill, project, or relationship is by following The 20-Second Rule to lower or increase the activation energy required for a task. What did I just say?! OK, I got this tip from the book The Happiness Advantage by Sean Achor, which in turn pulls from research by the psychologist Mihaly Csikszentmihalyi (had to Google the spelling for that guy 😏). Activation energy is the reason why it’s so hard to go out and do stuff. It’s the barrier between you and the thing you want to do. High activation energy = more energy required to “activate” yourself to do a task. The 20-Second Rule is a rule of thumb to follow for lowering that barrier. This rule of thumb states that if you decrease how long it takes for you to get started on a task by just 20 seconds, then this already increases the chances that you perform it more consistently. This is because as human beings, we tend to like comfort and to take the path of least resistance. This just means that if you want to do something, you have to make it easier for yourself. So what does the 20-second rule look like in practice? Well, here’s a personal example. Say I want to form the habit of reading at least 25 pages a day. Applying the 20-second rule would mean that I keep books lying around the house all the time. This way, whenever I’m walking around and spot a book, I can just pick it up, flop down on the nearest surface and read. The proliferation of my stuff around the house drives my parents nuts, but this is part of the reason I can get through so many. And similar to Thomas’s example in the video up top, I keep my guitar beside my study area on a stand and in plain sight, so it’s easy for me to pick it up and play it. On the flip side, if you want to stop doing something, you can still use the 20-second rule, but now, instead of making things easier to do, you have to make them harder for you to do. Remember my previous example where I talked about the positive side of having books around all the time? In the same vein, I’m easily distracted if I see a book. So on the desk where I study, I’ve turned most of the book titles towards the inside, so I don’t notice and pick one up when I’m supposed to be studying. As my mom likes to say, “Out of sight is out of mind” (though, honestly, when the craving hits… there’s just no cupboard door that can stand in the way of me and a bag of Lays BBQ). OK, now that you know all about activation energy and the 20-second rule, how should you implement this into your daily routine when you want to stay consistent with a habit? The next time you feel motivated to start on a new habit, rather than jumping in and doing it right away, stop. Instead, channel your enthusiasm into creating plans, gathering tools and thinking up step-by-step systems, including any maintenance tasks you may have to do to keep the whole thing going. This way, you’re setting yourself up to succeed, even if you don’t feel like doing the task you have to do. For example, when I committed to going to the gym regularly, I didn’t just sign up for a membership, grab my running shoes and start pumping iron. A set time in my schedule to get to the gym, workout and go home – with time to spare. If one of these pieces were missing, I would find a (usually dumb) reason not to go. I made sure to take out my dirty gym clothes every Friday and to put in a fresh set every Sunday night. I put my gym bag, with everything I needed – clothes, water bottle, lock, hair tie, running shoes, and socks – next to my school backpack, so I could grab it when I left for school in the morning. I created a base workout plan for the week on Evernote during my weekly planning session. This way, I could simply duplicate and update this at the end of each workout, instead of creating a new one from scratch each time. Let’s make things super practical with a personal case study. Here’s what I’m up against: I write almost 10,000 words each week for my blog, College Info Geek and my school submissions – reports, case analyses, assignments, reflections and the like. Because of the volume of work I need to put out and the limited time I have, I need to be as efficient as possible when I sit down to write. Not getting my writing done because I have writer’s block is not an option for me. For the planning portion of the 20-Second Rule, I create outlines every Saturday morning for all of the Defy Gravity and College Info Geek articles I want to write for the following week. Similarly, before I write anything for school, I make sure to create a topic outline for the points I want to hit. Under each topic, I also type all relevant quotes verbatim, along with any corresponding citations and footnotes. This step helps my writing flow when it comes time to sit down and write; I don’t have to worry about formatting, citing sources, or forgetting a point – I just have to think and write. Now for the actual writing part – this is where my Scrivener setup comes in. At any given time, I usually have one Scrivener project each for my blog, one for College Info Geek and another one for that school semester. When I open my laptop, Scrivener is right in my dock, so it’s a cinch to click it and pick which writing project I want to work on today. I also save all my projects in Rich Text Format to my Google Drive so I can work on my writing from a school computer, even if I don’t have my laptop with me. When I open a project, I know exactly which document I was working on last and can quickly jump into the writing. How’s this for a photo-ception? Finding the time was a bit trickier but, I figured, since I take a 50-minute, WiFi-less train to school every day, I can do my focused writing for CIG and my blog then. This way I remove the distraction of the internet and beat procrastination because I feel a sense of urgency to finish writing before the train gets to my stop. I’ve also set a rule to prevent myself from feeling overwhelmed from all the writing and task-switching I have to do every day: Once I arrive in school, I only do schoolwork. Similar to the train, this rule prevents me from procrastinating on my schoolwork too much because I know that when 6pm hits, I stop all my schoolwork, regardless of whether I had finished what I was doing or not. This combination of breaking up the outlining and writing process, while having a set place and time to write allows me to produce 1,000 – 2,000 words every day, 5-6 days a week. As you can see, I can do a lot everyday not because I have superhuman willpower, but because I’ve made it almost impossible for me to fail. Similarly, forget about relying on finicky willpower, and the volatile ebb and flow of motivation. Instead, when you feel pumped to make a change in your life, start small and make a plan. The plan should lower the effort it takes to sustain that change in your life, so you don’t have to rely on external factors and your emotions to stick to your guns.